Ukrainian politics is not without a sense of humor, it seems, and while the parliament has long been famous for hosting punch-ups, this week history was made as an internet meme took its seat in place of some lazy officials. 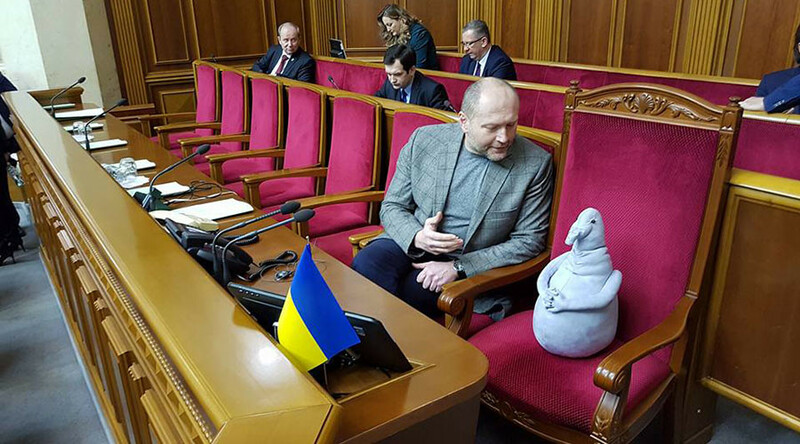 Independent MP Borislav Bereza brought a stuffed toy of “Zhdun,” which roughly translates as “the one who waits,” to parliament on Friday, in a stunt aimed at shaming politicians who don’t show up to perform their civic duty. Bereza said in a Facebook post that less than half, or 150 of 322 MPs, were physically present and that: "Like a majority of Ukrainians, [Zhdun] is waiting for MPs to start attending and working. He does not lack time or patience. Unlike Ukraine." The stuffed creature is a replica of a sculpture by Dutch artist Margriet van Breevoort, which became an internet sensation in Russia after being posted on social media site Pikabu, with netizens superimposing the would-be politician into a variety of famous works of art and pop culture favorites. Here he is contemplating the meaning of life. Zhdun is not just restricted to fine art, but is also tech-savvy, it seems. He remains active on social media when he finds the time in between important meetings at parliament. After a long day at the office, Zhdun seems to enjoy a refreshing beer as much as the next person.